Scaler from Plugin Boutique is a new MIDI utility plugin which, to be honest, knows far more about Music Theory then you ever will! While there has been an element of controversy from music extremists surrounding the plugin calling it cheating, a much higher percentage of us really don’t care about these opinions and see it as a new modern way to further our understanding of music theory in a fun environment, entirely trumping the old ways of learning. The world of music theory to today’s computer-based musician and producer has been seen as unnecessarily complex for some time, therefore the majority go without ever bothering to learn, and for some, the process of making music can suffer for not understanding even the most basic of concepts. Do you need to know music theory to make music? No, absolutely not, all I’m saying is once you understand, it will become so second nature that you won’t even have to think about it. Music theory in its simplest form is nothing more than a set of guidelines predetermined by people to dictate what sounds good and what doesn’t. You can read any music theory book out there and they will try to confuse you with a whole bunch of terms on tonal harmony and treble clefs, but in the 21st century, I believe we are smart enough to look past this and understand that anything can be made simple when you break down into actionable steps. Scaler does exactly that! this remarkable new utility plugin understands the modern musician and producer like no other, focusing on new genres such as EDM, Hip Hop, Drum & Bass and many others, so if you’re making music of today, utilizing a plugin like scaler can help you in big way and help you find new chords and progressions with ease. Scaler is a unique and inspirational MIDI effect that makes finding chords and progressions intuitive and fun! Detect what key and scale you are in by playing some notes/chords. Explore tons of scales and chord sets from various genres and artists. Create, edit, save and export your own chord sets. In short depending on how imaginative you are as a composer, i bet you can think of a thousand different situations that Scaler could of helped you, imagine this,: you’re making a track and have nothing but root notes, boot up Scaler, hit Detect mode, play the track and scaler will analyze the data it’s received and tell you what key you key you’re in and alongside that suggest a series of chords that fit the scale. In the event that multiple scales match your input, you can check the scale style description of each of the scales to determine what suits your track the best. 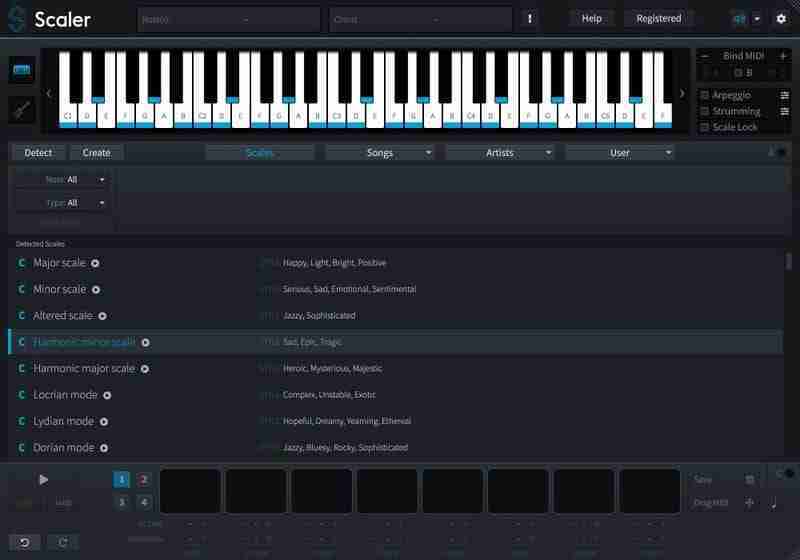 You can then preview how the chord sounds Simply drag and drop chords in the slots and play them or export the MIDI to your DAW, sounds crazy right? The plugin comes with a few built-in sounds, but you can also route it to another virtual instrument as well. The interface also has the controls to change both octaves and inversions of the chords you pick, and once you’re done you can save your own chord sets and then hit the BIND Midi option to play your chord sets by hitting only one note. With the onboard bank of 1,728 scales and modes including genre and artist presets, there’s more than enough to keep the juices flowing. Scaler is available for Windows and Mac (VST/AU/AAX), priced at £39.95 GBP/$52.56 USD Check the 3 minute video below to get a quick overview.